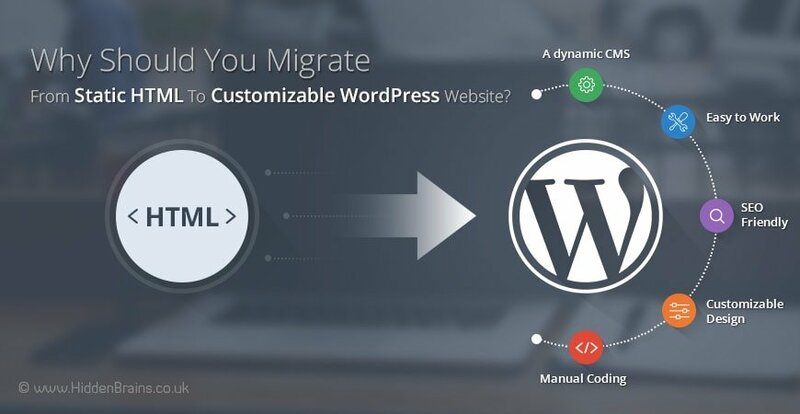 Why Should You Migrate From HTML To Customizable WordPress Website? As the tech geeks define it, WordPress is the most efficient open source tool for website creation that is written in PHP. For those who do not understand these heavy technical terms, WordPress is the most powerful and easy-to-use content management system for building blogs and business websites. In this blog we are explaining you reasons for convert html to WordPress. 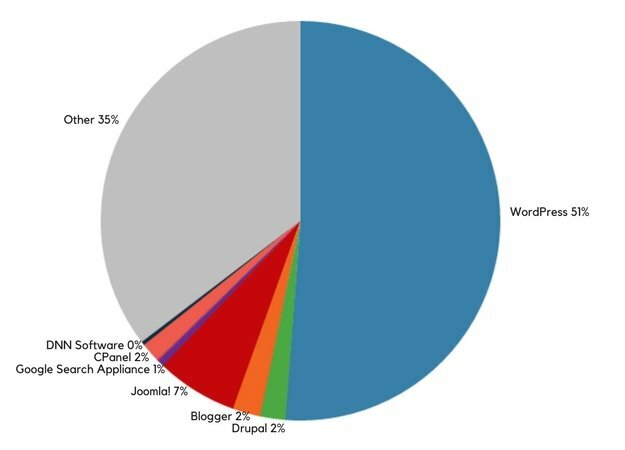 If statistics are anything to believe, the pie chart shown below represents the contribution of WordPress websites among all CMS platforms. WordPress usage has surpassed many leading technologies such as Drupal, Blogger, Joomla and others. When so many people are using this platform, it surely would have interesting features that benefits businesses. Why has WordPress become much-talked about technology in website development arena? What business benefits can be expected by converting your HTML website to WordPress? Why should I opt for WordPress theme? The answers to these questions can be explained by simply listing an array of advantages of WordPress. One biggest advantage of using WordPress is that this platform is open source, which makes it extremely easy to manage and maintain. This CMS is open for all sorts of customizations and do not restrict your creativity or innovation zeal with respect to website design and development. What’s more surprising is that you need no coding proficiency to use WordPress. The freedom to host your business website the way you want without the need of HTML coding expert is just like a cherry on the cake! Website is the face of your company, agree? This means that you cannot comprise even a bit with the look and feel of website. In layman language, website is basically how you represent your company to the online world. Appealing themes, thousands of free ones and exclusive templates available at minimal price, WordPress has spoilt users for choice. Getting business from online customers solely depends on how they look at your website or what kind of impression does it create on visitors. Whatever is the nature of your business, there a suitable theme that you can come cross by browsing through innumerable options at WordPress Theme Directory, Theme forest and Elegant Themes. Most of these themes are responsive in nature, which supports the current trend of accessing everything on mobile. These themes also abide by the new Google rule of ‘mobile first indexing’. In spite of thousands of available options, if nothing fits the imagination of your aspired business website, you can contact website design and development company to include high-level customization in the basic WordPress template. This way, you can get the website of your choice that suits your requirements and preferences. Being so much renowned in the online world, several developers have mastered the development and customization of WordPress websites. Search for WordPress developers on hire should not be a difficult task as many have proficiency in using this CMS platform. Easy availability also means you need not shell out extra dollar for getting hold of one. Employing a WordPress developer or a team to manage and built your business website can be much cheaper than opting for other PHP-based websites. Less coding mean less efforts, which eventually reduces the cost associated with manpower. 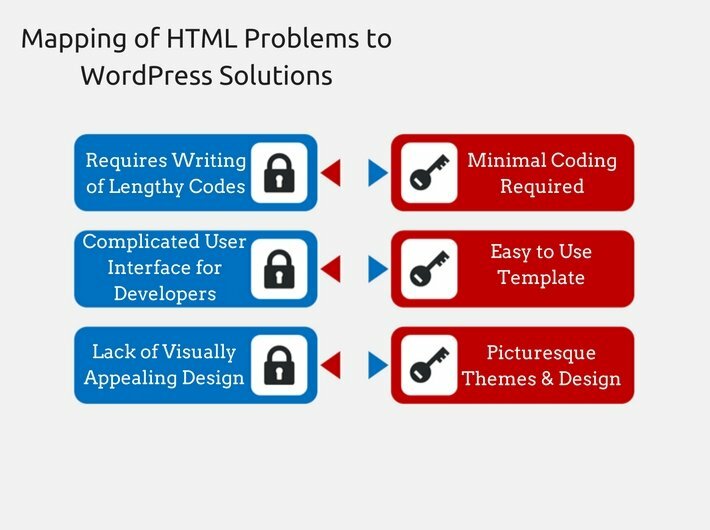 As stated above, WordPress website development requires minimal coding and no special technical knowledge. On the contrary, the HTML website has multiple lines of code to implement the smallest of functionality to the website. Apart from addition of features, even changing the text requires you to write down few lines of coding. With this respect, WordPress offers immense convenience and flexibility to developers by enabling to make quick and dynamic changes. Revisions to existing websites, which is a regular practice in every company, can be implemented easily without any overhead. Website maintenance and support becomes a cheesecake after migrating to much efficient dynamic CMS WordPress platform. Though the WordPress theme is fully compliant to your business offerings, you may wish to add few features that the theme doesn’t offer. 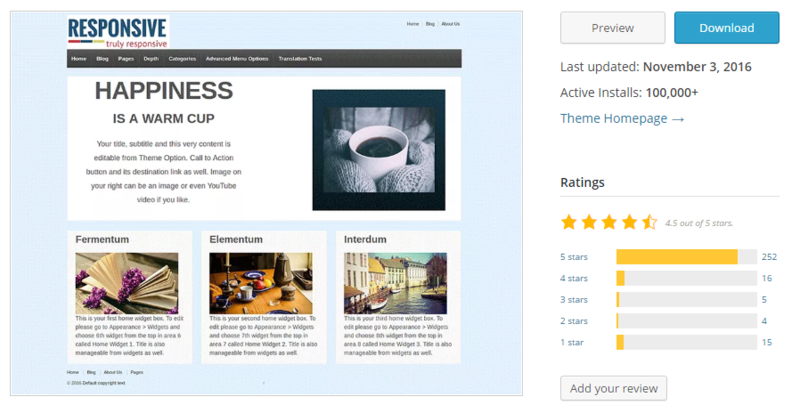 For requirements like these, WordPress offers deluge of plugins to incorporate in your selected theme. All you have to do is add the plugin to your existing WordPress template code and enjoy the outcome. Upon exploration of plugins at WordPress, you would come across such interesting ones that you would like to include in your website, even though it was not a part of your plan earlier. WordPress website has the biggest advantage from SEO point of view. Features of WordPress website are such that crawler moves smoothly over every blog, page and category to take in the required information. Websites built on WordPress templates have experienced good rankings in search engines, thereby strengthening your presence over the internet. 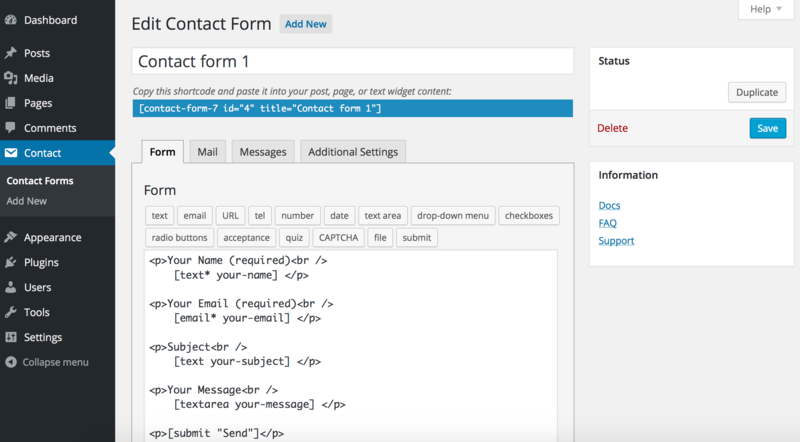 Are you willing to shift your website to HTML to WordPress CMS? 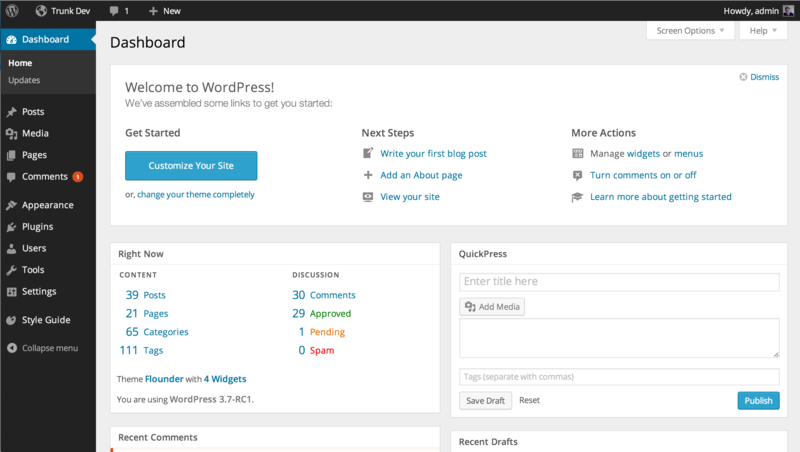 List of features of WordPress is enough for one to gauge its usefulness. Bloggers and business websites who have used this WordPress template are enjoying its unlimited benefits. Contact Us for HTML to WordPress services and get your appealing website built in no time!